IMPORTANT: After installing the IntelliGolf software and starting a new round (i.e. Play) tap on the Menu button (at any time) for a list of options (e.g. download courses, add players, exit, etc). On newer smartphones (e.g. S5, S7, etc) press and hold the bottom right (Recent) key or press the two outside buttons at the same time to get to the Menu options. To view GPS-based course maps (via Google Maps) tap on the GPS icon in the lower left corner of the scoring screen. Then, tap on the Map icon in the upper left corner of the "IntelliGolf - Distances" screen. Try "long pressing" on a Course name, Player's name, or Round of golf. Long pressing on a Course name will let you Edit, Delete, Start Round, or Call the Course from your smartphone. Long pressing on a Player's Name (e.g. you) will let you View, Delete, or select Club Preferences (e.g. select the clubs you carry in your bag) for shot tracking :-). Long pressing on a Round will also let you View, Resume, Post Round, view Scores, and/or Delete the Round. Other resources are listed below. Also, if you tap on the "golf ball icon" (e.g. hole 5) at the top of the scoring screen, you can jump to any hole (1-18) immediately to update scores or review entries. Have a Great Round! Click here to view a YouTube "Getting Started" video on IntelliGolf. 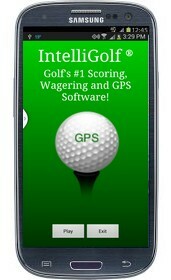 Click here to view IntelliGolf for Android screen shots. Blackberry OS 5-7 Tour: To view the Blackberry OS 5-7 Tour, please click on the Blackberry 8300 smartphone image. This tour will show you how easy it is to score a round of golf on your BlackBerry smartphone running RIM's OS 5.x-7.x. Blackberry OS 10 Tour: There is not a Tour yet for the new Blackberry OS 10 software. It is in process. As such, please see the information/text listed next to the Android-based smartphone (left side) for some tips on "Getting Started". As an experienced Blackberry user you should be able to figure out how to use the new IntelliGolf software quickly and easily after reading the Android tips. In addition, you are welcome to view the Blackberry OS 5-7 Tour (above) as all of the IntelliGolf products work in a very similar fashion. Have a Great Round! This tour shows how easy it is to score a round of golf using a Windows Mobile-based Pocket PC on the course and then upload the round information to the IntelliGolf desktop software. This tour shows how easy it is to score a round of golf using a Palm handheld or compatible on the course and then upload the round information to the IntelliGolf desktop software. This tour shows how easy it is to enter scores into the IntelliGolf desktop software so you can track your rounds. IntelliGolf's advanced IntelliGolf Technology ("Intellogy") makes it perfect for use on Windows Mobile, Blackberry, Palm, Samsung, Motorola, HP, HTC, Nokia, Sony Ericsson, and other popular smartphones.